So, you like your bottles and glasses, and they like you back. But you want more. From pet vines (tastier than succulents, easier than orchids) to getting your hands wet in the cellar, the world of wine growing and making is vast and astoundingly easy to explore. My neighbors’ unruly looking bush trained vines. For ease of exploration and the sheer joy of a field trip, let’s start with where wine is grown. You’ll find vineyards in every state of the continental US. And if it’s dirt you want, don’t limit yourself to only wine grapes. Grapes destined for non-alcoholic juice, jams, raisins, and picnic tables share quite a bit with those destined for glass bottles and stems. If you want to know what a vineyard looks like, all vineyards are fair game. Field trip! 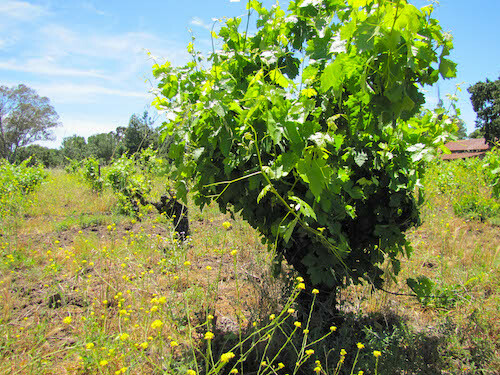 This neat little vineyard is a mile east of downtown Sonoma, California. The grapevine is part of a larger family of vines which fall into the genus Vitis. Left to their own devices, these woody climbers would run their tendrils up nearby trees, produce their tell-tale leafy canopy, and ripen fruit sweet enough to attract their reproductive transport of choice: birds. But, we’ve asked much more of them than a languishing life in the woods. Mankind harnessed the growing power and delectable grapes of the Vitis vinifera species by training the vine to framework that allows us easy control and access to its growth patterns and bountiful fruit. Climbing and clingy, young tendrils anchor themselves to a wire. In the vineyard, neat rows of vines line the hillsides and valleys. Above ground, the trunk, the canes, the leaves, and the fruit (in season) of each vine is readily visible. But, like an iceberg, below ground hides a deep and brooding root system. 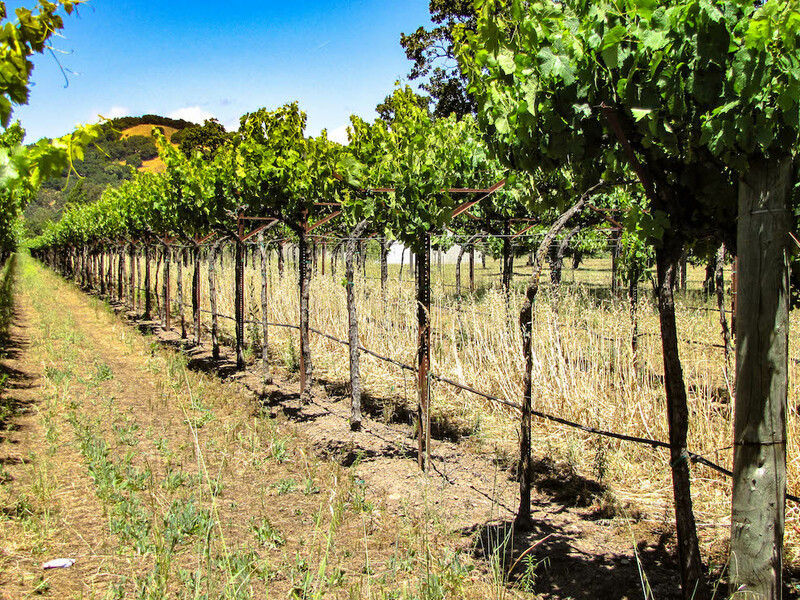 The above ground portion of the grapevine can be trained in a multitude of ways, from cane pruning to bush pruning, dramatically altering what we see of the vine, as well as how the surrounding environment (sunlight, warmth, moisture, and air circulation) interact with the vine. Below the ground, the roots of the grapevine tunnel down and down, seeking nutrients and water. Together, these two hemispheres of the vine give the plants and the vineyard everything we need to grow and harvest wine grapes. You can see the lingering remains of flowers and the start of grapes on this bunch. Grapevines reach harvest only after a vigorous cycle of growth and dormancy. Through budbreak, flowering, fruit set, veraison, and harvest; the vine is a marvel of growth and productivity. 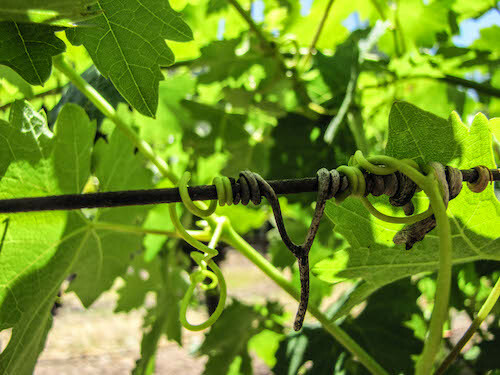 The vine sets off its growth cycle later in the spring than most other plants of its kind. So, in April or May of each year, the vine rouses itself and starts moving sap from its roots to the above ground (thus visible) plant. Bud break, that precious moment when new growth springs from last year’s wood, pushes through very shortly after. This new growth rears its green head and pushes delicate canes out to start their life. From these canes, burst forth the lush green leaves and delicate, perfect flowers. Around June and July, the precious green clusters that will become grapes develop. Later, in mid to late summer, a botanical magic show called verasion shines through the vineyard (the ripening process where the skins become translucent and develop gold, rosy, or red color). When these grapes hit their aria, around September, winemakers and wine growers start preparing for harvest. Last year’s harvest… and its destiny. Harvest is what kicks the cellar and winemaking engines in to high gear. And that’s what we’ll explore next.